Outlander’s episode title hit the nail on the head this week: we are definitely not in Scotland anymore. 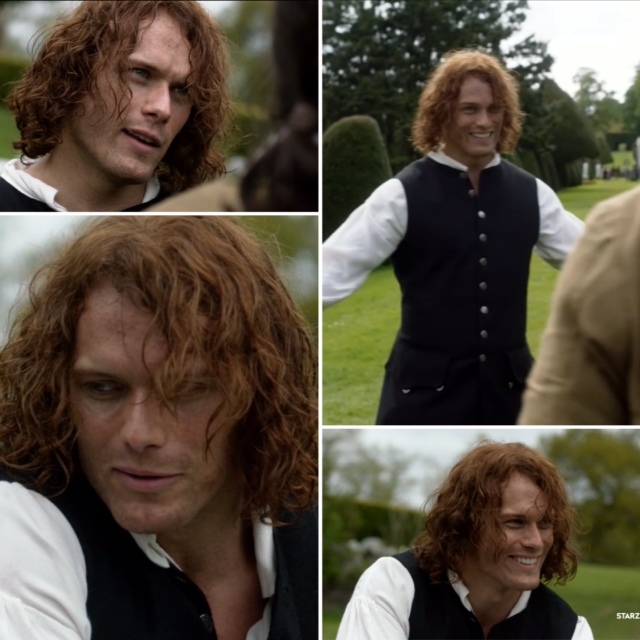 Episode 202, “Not in Scotland Anymore,” was jam-packed (and JAMMF-packed) with goodness. It was exquisite, lush, and brought out so many iconic characters from the books (what’s up, Master Raymond!). 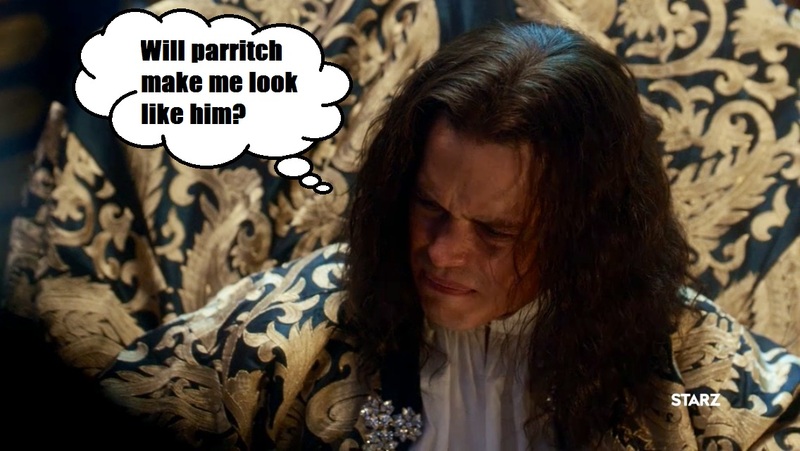 It was also—dare I say it?—the most comical episode to date, which was great because a little humor in the midst of Jamie’s PTSD is always appreciated. There were so many great moments this week, but let’s get down to the best of the best with our second installment of Outlander Superlatives. 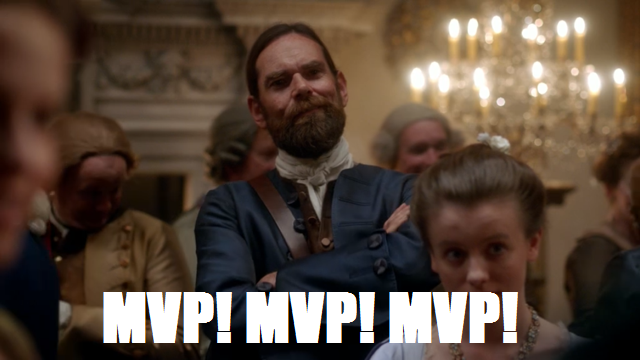 MVP – Murtaugh, Murtaugh, Murtaugh! I picture that Ron Moore, the show’s writers, and the execs at Starz all got together before the new season started and said, “You know who we need to see a lot more of this year? 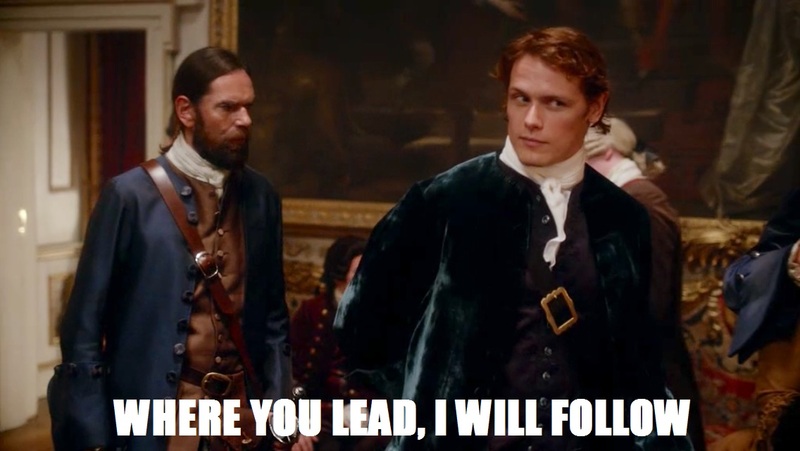 Murtaugh.” Murtaugh is winning Outlander right now. Between his disdain of France (last week it reeked of frogs, this week it’s “arses and armpits” as opposed to Scotland’s “animal smell”) and his pining over Lard Bucket and Big Head (AKA Rupert and Angus), Murtaugh’s musings deserve a show of their own. Or even a guidebook. I’d read the heck out of that thing. We all feel you, Murtaugh. We all feel you. 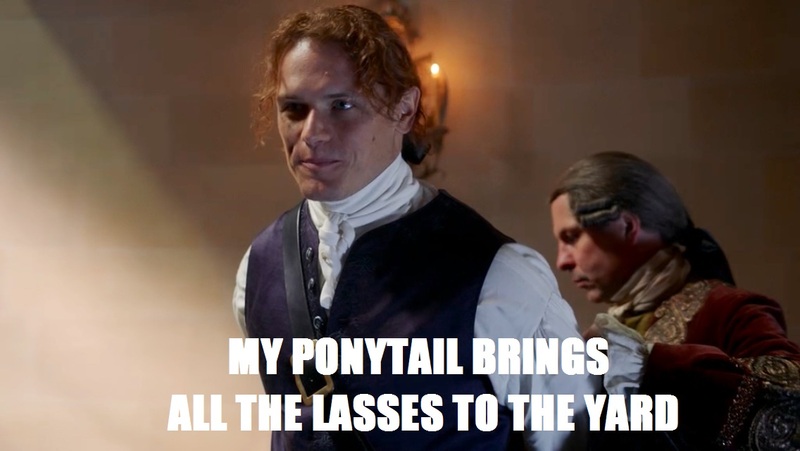 Confession time: I have a huge weakness for a man bun, and Jamie’s ‘do in this week’s episode was pretty much the 18th century equivalent. The man is to die for in his ponytails. He looks so refined, but almost like he’s not comfortable being so refined and can’t wait to rip the ribbon out but he won’t because, you know, court, fancy France, high society, etc. etc. That gorgeous ginger tail has got to be the sexiest thing to hit Versailles in centuries, and I’m pretty sure it was a big reason why Annalise could not keep her hands off of him. When you put that red mane up against all of the powdered wigs, is there really any competition? As much as I love my Jamie all gussied up in his fancy shirts and ponytails, there is nothing like a Jamie who has been working up a sweat. Let’s just take a minute to revel in it, shall we? Claire had a lot of Claire-esque moments in this episode, from her waxing adventures with Louise to her standoff with the Duke of Sandringham. 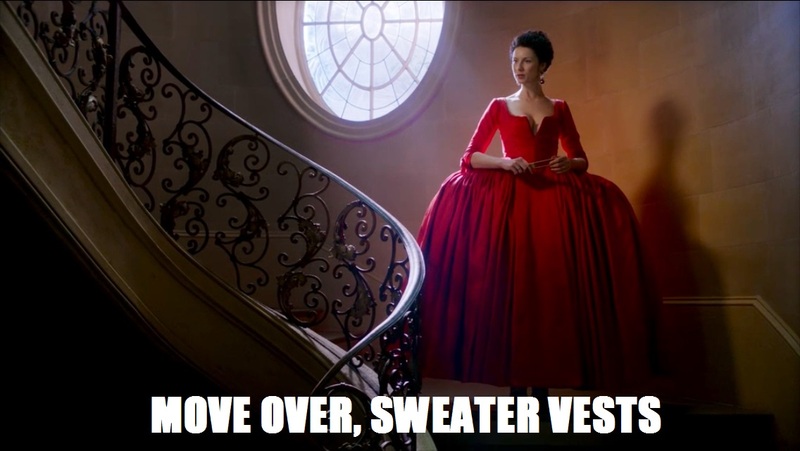 But the Claire who strutted down the staircase in that plunging red dress was a Claire who meant business. Certainly a far cry from 1948 Claire and her sweater vest. But seriously that sweater vest was fierce. I always knew being a royal must be hard, but I thought the snazzy crowns and palaces would make up for it. After seeing King Louis XV struggle to “go” on the chamber pot in front of an audience of, I don’t know, a billion? I’m having second thoughts. 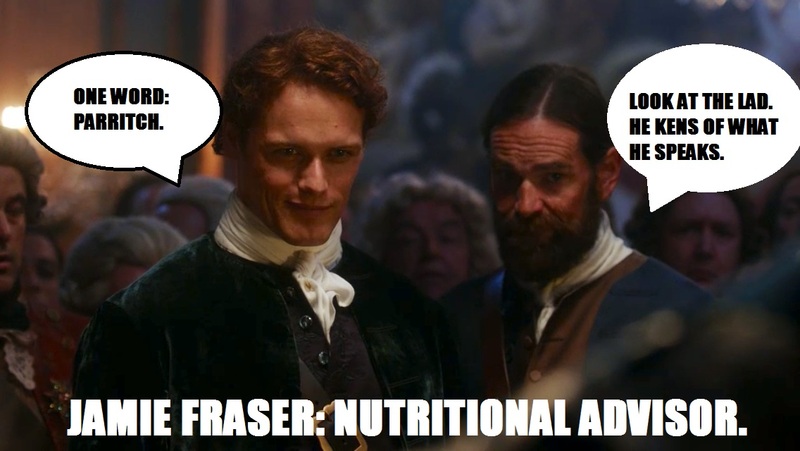 It was great of good ole Jamie to step in and give His Highness some nutritional advice to help bring on the royal deposit, but how about this tip: Give the man some privacy! So, friends, what say you? Who were the real stars of this week’s episode in your eyes? And can you even wait until next week? Jamie will be playing chess. And you can bet your bottom dollar chess has never looked so good. Did you miss last week’s installment of Outlander Superlatives? Check it out here! *I* canNA! Their true bromance feeds the soul.